Rinse and pat dry the steaks; season with sea salt & pepper. Put steaks in large Ziplock bags or a glass dish and drizzle with the olive oil. Rub in the garlic, toss in the rosemary sprigs, cover and let marinate in the refrigerator at least 2 hours, or up to 12. Set out on counter for 30 to 60 minutes to bring to room temperature before grilling. Grill or broil 5 to 10 minutes per side until a brown, golden crust forms, depending on thickness of steak and preferred temperature. Garnish with rosemary sprigs ( I make sure I grill mine with the rosemary still stuck to the steaks to give it a charred look for the garnish) and serve over dressed *arugula and a side of **Cannellini beans. *I like to use arugula, but you can use whatever greens you want: spinach, mache, etc. Toss the greens with a drizzle of olive oil and juice from half a lemon, salt & pepper (or you can use a flavored vinegar such as grapefruit or champagne, instead of the lemon juice). **Soak Cannellini beans in water 4-6 hours, or overnight. Rinse, cover with fresh water, a drizzle of olive oil and bring to a boil. Simmer on low anywhere from an hour to 3 hours, adding more water if needed, until the beans are soft. When the beans are soft and most of the water has evaporated, then you can add sea salt and a little pepper. Garnish with a nice green olive oil, such as parsley or basil, and a lite sprinkling of grated Pecorino cheese. Note: I only had Parmesan on hand, and it didn't melt like I wanted it to for the picture....and I didn't have any infused olive oil, so you'll have to visualize it. Asparagus is optional and only there because Corey isn't eating "carbs" these days, so he needed two vegetables. 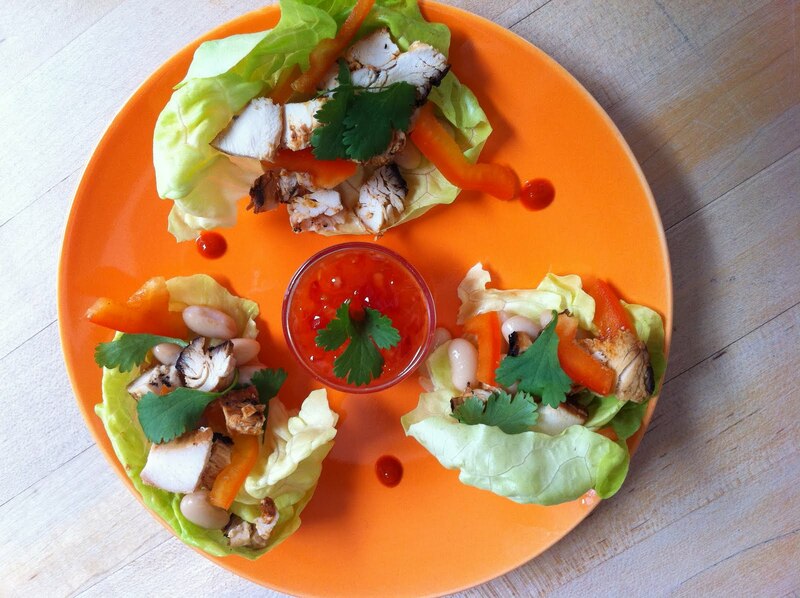 Trio of lettuce cups with bbq chicken, white beans, red bell pepper, cilantro, sweet & sour chile sauce, & Sriracha.